Wooden floors remain the most valuable asset for every property – one that must be under full protection at all times. The safest and greenest way to do so is through waxing. With our floor waxing services, you receive the protection that stays close to the wood’s natural state. There’s understated elegance in this minimalistic look that brings out a pleasant rustic atmosphere. When you choose floor stripping and floor waxing services are completed safety. We work with only the most high grade, eco-friendly wax on the market. A bonus point is that it comes from renewable sources and doesn’t strain the environment. What does this mean for your home or office? It means that you’re living and working in a clean environment! Your floors are coated with a thin, completely natural protective layer. Say goodbye to toxins and chemicals which eventually cause long-term damage to your wood. The organic wax allows for the wood to actually breathe and keep its tough but elegant exterior with limited penetration and limited application. What we believe in is giving you a finished product that meets your needs and exceeds your expectations! Organic Products: Ensure the health of those closest to you with a natural wax material that is chemical-free and leaves no imprint on the environment. Moreover, they increase the longevity of your floor. An Expert Consultation: The specialists visit your property to assess and examine and give you a detailed estimate regarding your service. Diverse Application: The stripping and waxing process can be applied to wooden floors in all residential and commercial buildings and performs exceptionally with all levels of traffic. Waxing, oiling, staining, and sealing – the professional and reliable employees know everything about your wooden floor! Simplified Cleaning: Waxed wooden floors allow for easier wood floor polishing, saving you time to tend to tend to the bigger things in life. 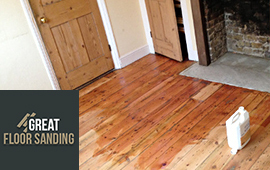 How to Have Your Floors in London Waxed? The easiest way to contact us is to call us at 020 3404 9697! We always have a person in the office to take your call whether it’s a workday or the weekend, early in the morning or later in the afternoon. You can ask for a booking, request more information regarding our stripping and waxing service and receive a no-obligation quote. Be advised that you can reschedule your service date at any time as long as it happens 24 hours before the initial date is due.